Tuesday was a remarkable day for Colorado River Basin governance. With the kinda sorta now approved Drought Contingency Plan, we have the first formal commitment from the basin states to quantified water use cutbacks of more than a million acre feet per year as Lake Mead drops. With important caveats, this is enough to stabilize the reservoir. This is arguably the most important milestone in river management since the early 2000s. The last-minute deal cut out the Imperial Irrigation District and, in the process, Imperial’s claims and concerns about the environmental and health quality problems associated with a shriveling Salton Sea. 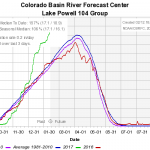 There is blame to go around for this messy end, but at its root it is a profound failure of Colorado River Basin governance. One of the most important side effects of our efforts to reduce Colorado River water use over the last two decades, a problem that affects a lower income Hispanic community, was formally, visibly, and explicitly left out of the decision at the 11th hour. Depending on what happens next, this could become a singularly important element of the above mentioned “most important milestone in river management”, and not in a good way. It’s a pretty striking visual, given the assumptions that went into it. 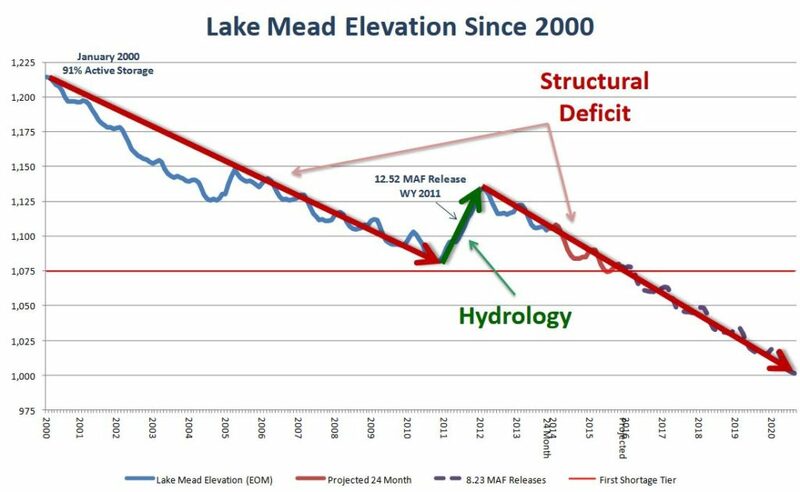 Given that reality, as the Bureau’s Terry Fulp said in my last book, “Lake Mead will go down.” The math here is not hard. It also is not hard, in principal, to see what is needed to fix it. Use less water. DCP does that. Under DCP, the states (and Mexico, under a companion agreement) have agreed to a series of cutbacks as Lake Mead drops that would slow its decline and, when it reaches an elevation of 1,030-1,040 feet above sea level, would fully meet the 1.2maf “structural deficit”, as Tom described it in 2013. Rather than trying to cling to their Law of the River-promised paper water allocations and lawyering up, water users of the Lower Basin have collectively agreed to reduce their use by more than a million acre feet per year. This is a striking confirmation of the central hypothesis of my last book – that we have entered a new era of collaborative governance on the Colorado River, that water is no longer for fighting over. 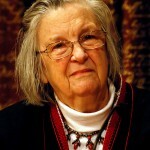 “I have six grandchildren who live on the Salton Sea and five of them have asthma. On behalf of them, I say, ‘Damn them. Damn them,’” said IID board member Jim Hanks. The linked story by Wilson and the Arizona Republic’s Ian James explains the background, but in short the Imperial Irrigation District made a last-ditch effort to condition its participation in DCP on federal funding to help mitigate environmental and public health problems associated with the Salton Sea. 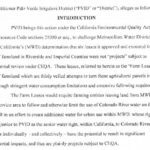 In a push to get the deal done California’s other Colorado River Water users, led by the Metropolitan Water District of Southern California, cut IID out of the deal and forged ahead without them. 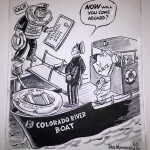 In conversations with Colorado River leadership over the last week, I’ve heard a combination of sympathy for the stance taken by Hanks and his colleagues and frustration with the way Imperial handled the whole affair. The process by which California worked out the details of its DCP agreement was relatively opaque, so it’s hard for those of us on the outside to understand exactly how this happened. 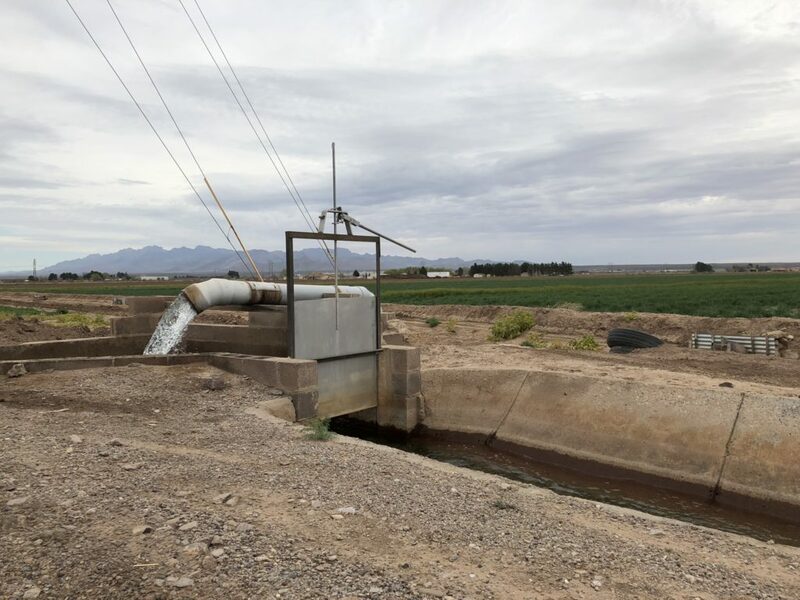 Clearly until late last year, the Imperial Irrigation District was generally supportive of DCP, negotiating some valuable benefits – new water management flexibility and the ability to bank water in Lake Mead. Those things would have been of great benefit to Imperial and the rest of the basin. We all thought IID was on board. The pivot in late 2018, with the added demand for money from the U.S. Department of Agriculture for Salton Sea mitigation, left a bunch of DCP negotiators frustrated. So I guess blame on Imperial here for not making more clear from the beginning what it needed from a DCP. But there is a deeper issue here for which California’s entire Colorado River water management community, and perhaps the entire Colorado River Basin water management community, is to blame as well. The problems of the Salton Sea are in significant part the result of decisions made in the early 2000s to begin bringing the Colorado River Basin’s water use into balance through reductions in Imperial. It was clear even then that one of the consequences would be a shrinking Salton Sea, with environmental and public and public health effects. Commitments were made by the state of California that haven’t been kept. It shouldn’t be Imperial’s responsibility to solve the Salton Sea, it should be all of our responsibility. So a good outcome, or a bad one? Leaving IID out of the Lower Basin DCP might make sense for a number of good reasons (especially with the great snowpack which reduces the risk faced by the Metropolitan Water District of Southern California in shouldering the DCP burden without IID’s help), the question policy makers should consider is in the long run (post 2026 for the Colorado River Basin) is such an action going to make it easier or harder to manage conflicts on a shrinking river? On balance, I think it was a good week. We got a DCP, with commitments to water use reductions that are sorely needed. And while Imperial didn’t get what it asked for, I hope we’ve all learned that we can’t solve the West’s water problems without solving the Salton Sea. The Colorado River Board of California voted 8-1-1 Monday to sign on to a multi-state drought contingency plan, which, somewhat ironically, might not be needed for two years because of an exceptionally wet winter. The process was fractious until the very end, with blistering rebukes from the river’s largest water user, and charges that state and federal laws were possibly being violated to cross the finish line. The Imperial Irrigation District, a sprawling rural water district in the southeastern corner of California, refused to sign on until the federal government pledged to provide $200 million to clean up the Salton Sea, which has not occurred. Update based on questions on Twitter and in the comments: This number represents all Albuquerque municipal water use – residential, commercial, parks, system losses, etc. Frequently per capita usage numbers quoted are for residential use only, so beware apples-oranges comparisons. 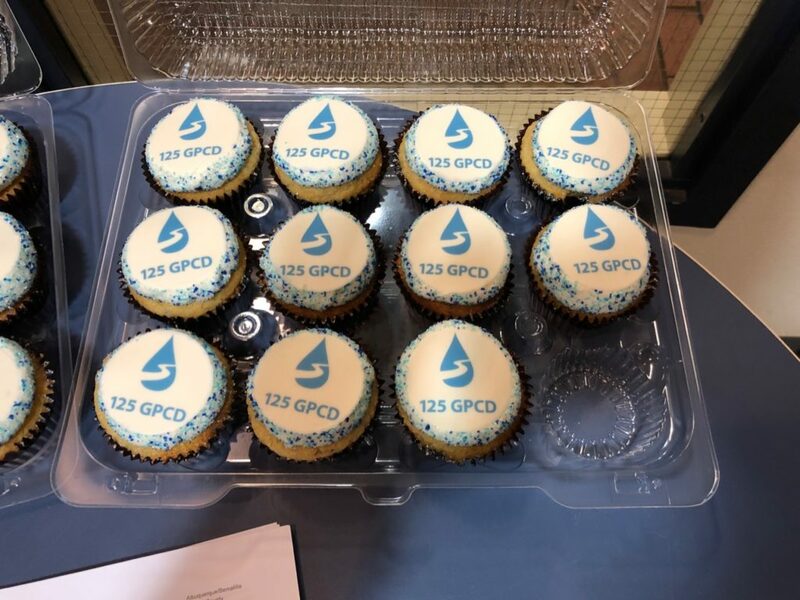 Previously: There were cupcakes on a table by the door at the most recent meeting of the Albuquerque Bernalillo County Water Utility Authority: “125 GPCD”. 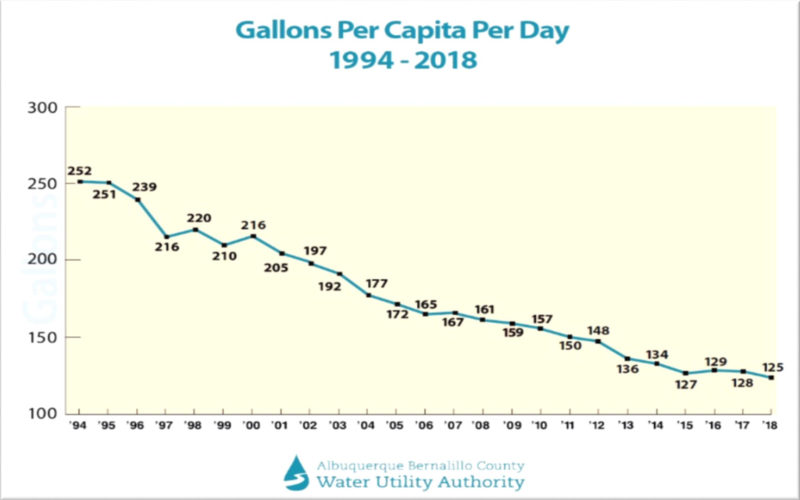 I have some schtick in my standard water talks: “Albuquerque has, since the mid-1990s, cut its per capita water use nearly in half.” That’s a pretty remarkable thing – a large community cutting its per capita use of a critical resource nearly in half, with no ill effects, in a bit more than two decades. Now, I can drop the “nearly”. 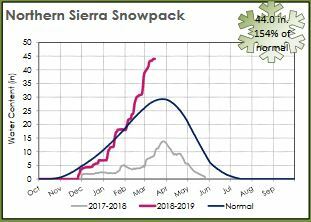 The 2018 numbers are in, and we’ve reached 125 gallons per capita per day. Like many who manage, engineer, utilize, plan for, and write about western water today, I grew up with the expectation of catastrophe…. [A]s drought set in again across the Colorado River Basin in the first decade of the twenty-first century, I was forced to grapple with a contradiction: despite what had Reisner taught me, people’s faucets were still running. Their farms were not drying up. No city was left abandoned. I didn’t talk about it in the book, but one of the keys for me was Albuquerque’s aquifer. 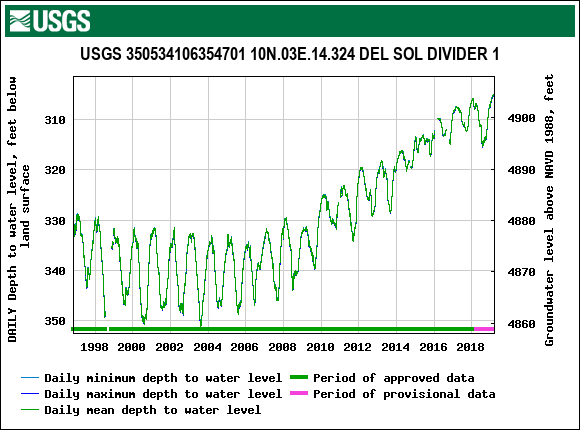 As we pushed the conservation above – along with a significant supply shift to make use of our imported Colorado River water – our aquifer began to rise. Our water use is down, our aquifer is rising. And we’re still meeting our legal delivery obligations to Elephant Butte Reservoir under the Rio Grande Compact. The system is not only in balance, net storage here is going up. I know, I know, past performance is no guarantee of future results. Things get harder, not easier, with a growing population and a warming climate. But we’re doing pretty well. 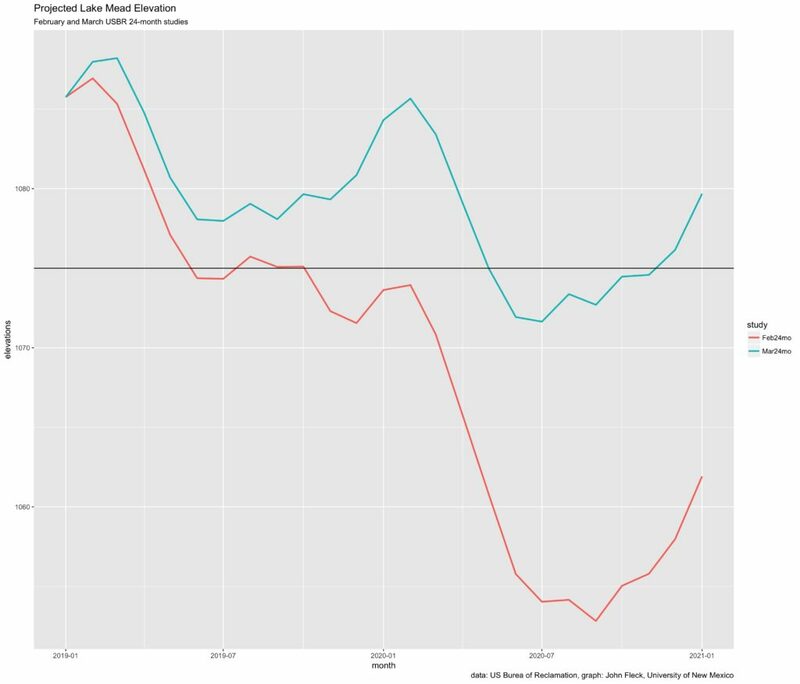 The booming Rocky Mountain snowpack has eliminated the risk of a formal Lake Mead “shortage” declaration in 2020, and has substantially reduced the risk in 2021, according to the latest Bureau of Reclamation 24-month study. More importantly, in my view, is the reduction of a longer term risk of a legal battle over the Upper Basin’s Mexican Treaty delivery obligation. 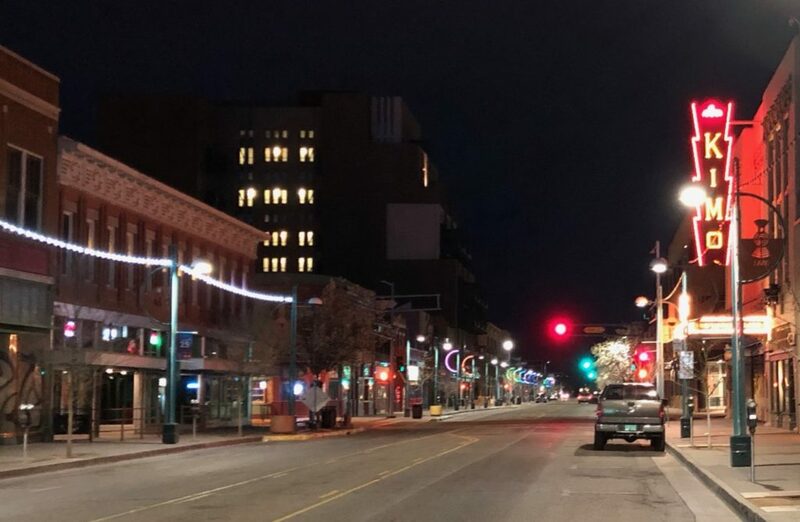 The current forecast calls for Mead ending 2019 at elevation 1,080, five feet above the threshold at which a set of rules previously developed by state and federal governments would have reduced allocations to Arizona, Nevada, and Mexico. That is more than eight feet higher than the projected elevation just a month ago. It’s that shift from a 7.48maf release next year to a projected 9maf release, the result of operating rules in the 2007 Interim Guidelines governing balancing the contents of Mead and Powell, that’s the huge deal here. It means the water users in the Lower Colorado River Basin will continue to get extra water, above and beyond their legally expected 8.23maf releases each year. 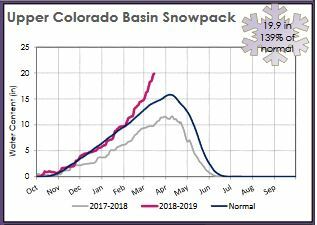 If this forecast holds, it would mean that since 2011, the Upper Basin would have delivered an excess of at least 9.4 million acre feet, above and beyond the legal requirements of the Colorado River Compact. A series of 7.48maf releases from Powell – possible under the current operating rules if we were to have really bad Upper Basin hydrology – would have put us into dangerous legal territory, in terms of how the rules governing water delivery obligations under the Mexican treaty are interpreted. 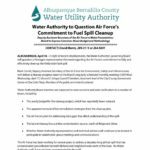 One of the basin’s unresolved legal questions is the extent of the Upper Basin’s obligations to deliver half of the water needed to meet the U.S. obligation to deliver 1.5maf per year to Mexico. A series of 7.48maf release years could have forced a legal test of that question, which is one of my “how the legal system could crash” fears. 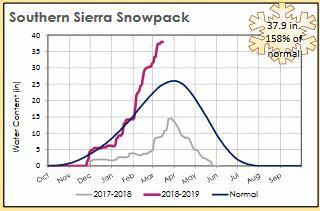 This year’s snowpack seems to have significantly reduced that risk for the foreseeable future. 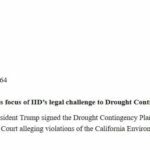 If, as being widely reported, the Colorado River basin states (and the major water agencies that largely dictate what the states do) ultimately decide to proceed with a Lower Colorado River Basin Drought Contingency Plan that cuts out the Imperial Irrigation District (IID), no one should be surprised. It’s simply continuing a long, and perhaps successful, tradition of basin governance by running over the “miscreant(s)”. The tradition started with the ratification of the 1922 Compact and the authorization of the 1928 Boulder Canyon Project Act (which authorized Hoover Dam and the All-American Canal). Arizona, led by colorful governor George P. Hunt, opposed the ratification of the compact. So what did the other six states do? They designed a six-state approval strategy and implemented it through the passage of the 1928 Boulder Canyon Project Act, which Arizona opposed but could not stop. By the 1940s when the basin’s attention had turned to the Mexican Treaty, Arizona had joined the compact club, ratifying it in 1944. The outliers were now California and its nominal ally Nevada. Both states opposed the Senate ratification of the 1944 Treaty. Their fate was the same as Arizona’s in 1928, led by the other five basin states and Texas (the 1944 Treaty includes the lower Rio Grande), the Senate easily ratified the treaty. In 1970 it was the four states of the Upper Division that got to feel the tire tracks. The subject was the operation of Glen Canyon Dam. The four upper river states were strenuously opposed to an annual minimum objective release of 8.23 million acre-feet per year because it arguably included an Upper Basin contribution of 750,000 acre-feet per year for Mexico (1/2 of the 1.5 MAF annual treaty delivery). The outcome was eloquently described by legendary New Mexico State Engineer Steve Reynolds as “they (the Lower Basin and Secretary Walter Hickel) crammed it down our #%&@#$ throats!” The obligation of the Upper Basin to Mexico under the 1922 Compact is still an unresolved issue. Thus, if the rest of the basin decides to move ahead with DCPs without the cooperation and participation of IID, it will continue a long tradition and one that many argue has benefited the basin as a whole. The major difference between the past and now is that in past decisions to overwhelm opposing states or major agencies, the issue was primarily the development of new projects. Today, with an overused river, it’s about the reallocation of water between those with senior rights (primarily agriculture) and those with junior rights but in need certainty of supply – the large urban centers that use Colorado River water. 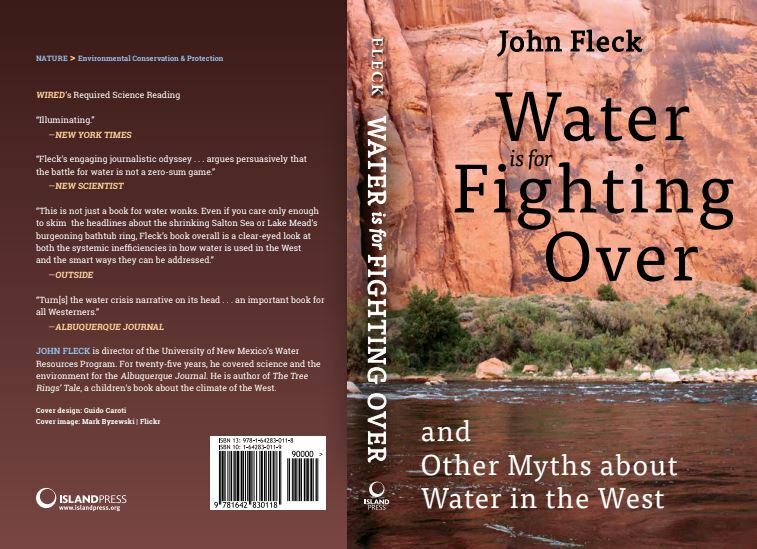 In our new book Science be Dammed, John Fleck and I argue that the beauty of the 1922 Compact was that it was a social contract between the faster growing states on the lower river (primarily California) and the slower growing states on the upper river to leave some water in the river for their future development. This allowed the states to cautiously form the coalitions necessary to pass the federal legislation needed to develop the river. As we have seen, for the major decisions there was rarely unanimous agreement. 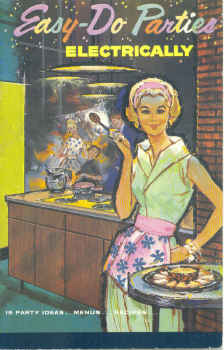 Today, in an era of reallocation of existing supplies, what is needed is a similar social contract between the haves, the rural areas of the basin that rely on agriculture (with senior rights), recreation and a healthy river and the have-nots, the urban centers with mostly junior rights, but with a need for certainty of supply and the political and economic power to overwhelm the rest of the basin. The goal of such a social contract would be to allow the inevitable reallocations, but only if there is a clear and real benefit to the areas-of-origin. Driving between old Mesilla, New Mexico, and the Rio Grande this evening after dinner, Lissa and I saw a bunch of new pecan orchards going in. We took last minute advantage of university spring break to head south. We spent some time wandering around looking at and thinking about the border, and also driving the roads of the Rio Grande valley floor as it spreads out south of Elephant Butte Reservoir on its way to El Paso and Juarez. Both things are, in very different ways, examples of the way human institutions shape landscapes on a grand scale. With the new book done, we’re in the calm before the new book storm, and I’ve been thinking back to an idea I’ve had for some time about at thing to write. I’m not quite sure how to explain it, but involves the way what economists would call “exogenous forces” shape landscapes. On the left is the El Mesteño Cattle Co. 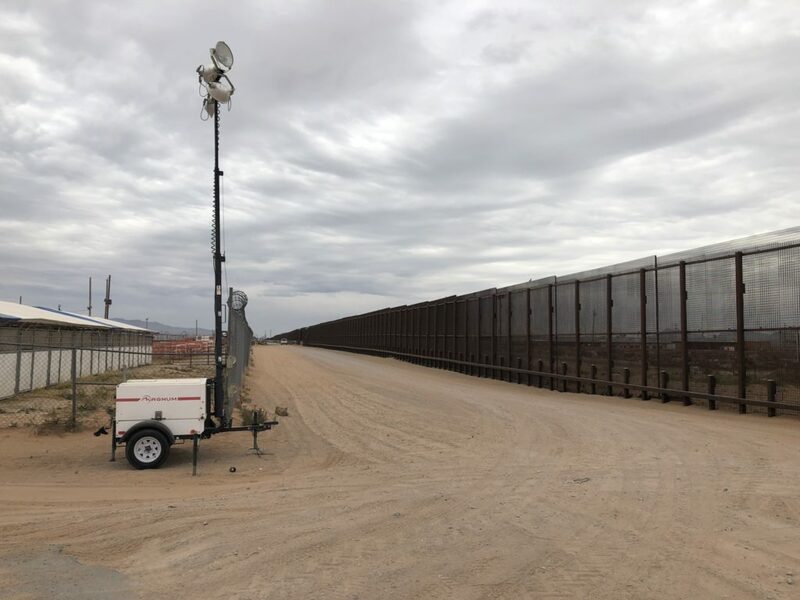 The thing in the middle is the U.S. Mexico border, I guess you’d call that a “fence”. Across the fence is El Mesteño’s counterpart in Mexico. It’s a transboundary cattle shipping point, in the middle of the desert. 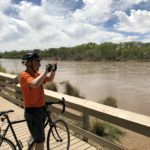 The border was more than a little uncomfortable, so Lissa and I dropped back down into the Rio Grande Valley and drove through miles and miles of pecan orchards, landscape shaped by a different set of exogenous forces. The result today is forests of pecan trees, at this point more than 30,000 acres and growing. Among the exogenous forces shaping this forest is a set of rules that permits groundwater pumping when surface water flows are scarce, as they have been in recent years. 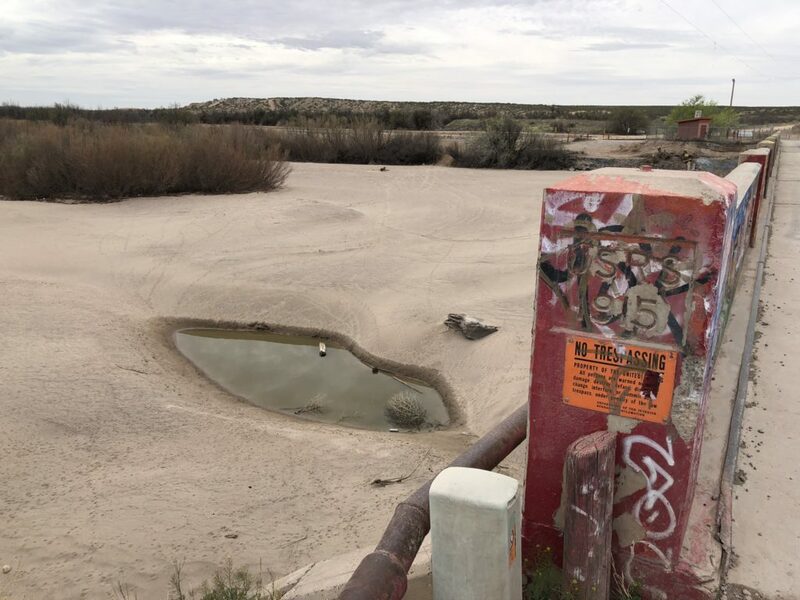 Among the countervailing ecosystem pressures, if one could think of them that way, is a lawsuit by Texas, against New Mexico, arguing that the groundwater pumping violates the Rio Grande Compact’s water delivery rules. A couple more threads here. Exogenous forces, shaping landscapes. There’s a story here somewhere. 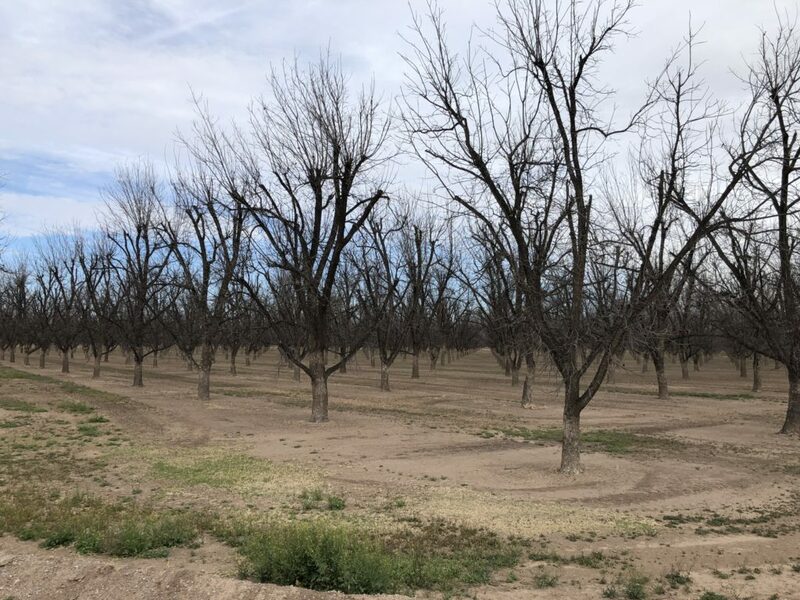 Now that Arizona finally seems to have its act together, the Imperial Irrigation District has become the lone holdout in piecing together the DCP. Behind the scenes, Met has been putting together its own Plan B: a DCP in which Met makes all the California contributions itself rather than having the deal depend on 250,000 acre feet from IID. This suggests something fascinating. 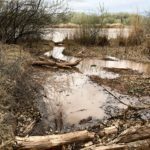 After some real struggles in the early 2000s as Met was forced to reduce its water use as California cut its Colorado River water use from 5-plus million acre feet per year to 4.4 million acre feet per year, Met is now acting like it thinks it has plenty of water – or at least, enough to shoulder the DCP burden without Imperial’s help.